Tabula Rasa: Why I Love Wednesdays! 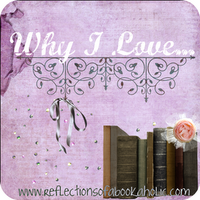 Why I Love Wednesdays is a meme hosted on every Wednesday at Reflections of a Bookaholic. "Wednesdays are often the time of the week where I have a sudden realization that the week is almost over. I'm always so thankful for this point. That's why I have created a weekly feature where I will highlight something I love that is book related. This feature is called Why I Love Wednesdays..."
I feel like I am stating the obvious by saying that Harry Potter was my most favourite childhood book! That would make my "Favourite Childhood Friends" Harry, Ron and Hermione; Ron a little more than the others! Like I always say, in case of Harry Potter, it is not just the actual book that makes it special. All the memories that I have attached to it, wonderful times that I had because of the book, talking about it with friends, not to mention, the Harry Potter games which we played - all that makes it much more than just a book! I read my first Harry Potter book ten years ago. At that time, and for a few years after that, it was my life. Harry's adventures, Ron's silliness, Fred & George's pranks, all of that in the most amazing magical school on the planet (and in literature!) - I can't think of another book that I actually experienced with the characters themselves! I cannot read those Harry Potter books, Yuck!! glad you have fond memories of times you had because of the book. I believe an entire generation of young adults would agree with your pick. It was a magical time! Sidne,The BCR - I admit I was a bit too obsessed with Harry Potter - but I'd be lying if I said it wasn't my favourite book ever! In my estimation the Harry Potter books were abolutely BRILLIANT and I can see why you chose them. I think I'm from the generation right befor yours but I still read, loved, and enjoyed these books. Three cheers for Ron, Hermoine, and Harry. I was a little older when I started Harry Potter so I didn't even think of Harry, Ron, and Hermione. They are great childhood book friends. Great post. Thanks for participating! Alexis - I guess I was 9 or 10!! After a certain age I didn't think of them as "friends" either, but back then I loved them! !